My mother is the flower of love and beauty, Plucked when the dew was freshest, and the snow tender. But then she was thrown to the mud and lurked in the dark. I only wanted to pick her up and make her bloom again. My mother is the thread of hope thrown in the tempest of fright and needing. She fought her way up the mountains, And cried her heart through the pain. I only wanted to be a soldier, To fight with and for her. My mother is the beauty of the night, And the glory of the day. Her smiles are delicate, And her eyes are wild. She's clothed in strength and her presence glorified. My mother is the lover to whom I'm charmed. My mother is the lonely bride graced in Scarlet, A fading ring on her finger, And a tearing silence in her heart. I only wanted to take her hand, And to make the walk down the aisle a happy one. 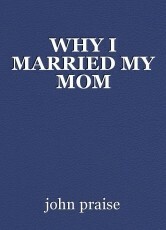 I married my mother because I'm all she has now.